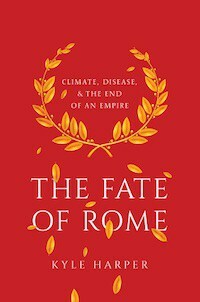 The first half of Richard Miles’ Carthage Must Be Destroyed: The Rise and Fall of an Ancient Civilization is useful, but there’s less of a focus on the culmination you know is coming, the Punic Wars. 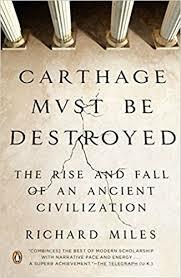 For a history of that, I’d actually recommend Adrian Goldsworthy’s The Fall of Carthage: The Punic Wars 265-146 BC (one of the best descriptions of Cannae). By utilizing archaeology and generating an inferred cultural history of Carthage, Miles does a great job contrasting the Punic mercantile republic with Rome. Aside from the penchant to name their leading citizens Hanno, Hannibal, and Hamilcar (to the point it’s hard to keep track of who is who), the most notable aspect of ancient Carthage seems to be its tendency to crucify generals who fail in battle. The Carthaginians come off as cartoon villains, even setting aside the child sacrifice. This is probably partly history being written by the winners, but it’s clear that still, Rome, in particular, was unique in its public spiritedness and social cohesion. This, despite the fact that Rome and Carthage had both converged on a system of an oligarchic republic during the height of their rivalry. 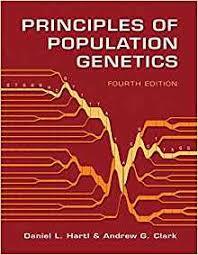 Ancient history, and reading about other cultures, is illuminating about the human condition because different peoples in different exigent circumstances seem to react mostly the same but to wildly different outcomes. For China, I don’t know of a better treatment in survey form than John King Fairbank’s classic. 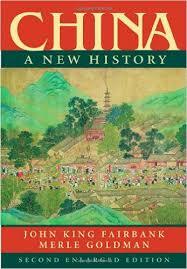 I also have a very soft spot for Jaques Gernet’s A History of Chinese Civilization. Fairbank’s book is more narrative history with some cultural fat on the bones. Gernet is more a cultural history with an exoskeleton of narrative diplomatic history. For Rome, there are many recent books. 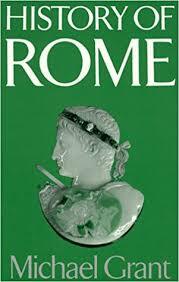 But I still really like Michael Grant’s big thick survey, History of Rome. I don’t know about Greece since I haven’t read Greek history much since I was a child. Though Grant has some books on Greece too. Finally, Michael Axworthy’s Empire of the Mind should be on a “to read” list. It’s a little off the beaten path because it’s a history of Iran. It’s got only superficial coverage of the recent past and tries to go deep into the psyche of what makes Iran Iran. 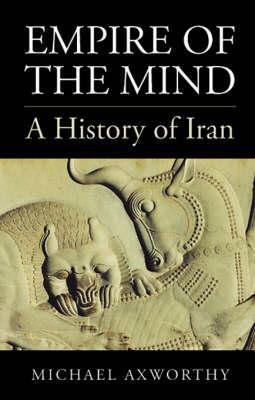 I think it is fair to say that the book ends of concluding that Iran, as we understand it today, is hard to detach from the Safavid period (when it become Shia). I think these civilizations of the Eurasian oikoumene are good places to start to understand the human condition because so many people were peasants and those ruled by peasants over the past 10,000 years. I would recommend a book on India, but those are mostly religious books. Islam comes a little late, as does Northern Europe. Much of Eurasia and Africa had no written language. If you understand China, Persia, and Rome, you’ll understand a lot. And probably enough. I just finished James Romm’s Ghost on the Throne, which I liked a lot, and I’m starting Robin Waterfield’s Dividing the Spoils, both about the wars between the Successors after the premature death of Alexander the Great. The former is a detailed history of the years from 323 BCE to 316 BCE, up to the end of the fist phase of the civil wars, while the latter ends in 281 BCE with the deaths of the last figures who had actually known Alexander and fought with him during his campaigns. I got those books because I knew very little about that period of history outside of the schoolbook-level outlines (“Alexander conquered the known world and died, then his generals fought each other, then the Roman Republic expanded east and took over their kingdoms”) and I wanted to have a clearer understanding of how the Hellenistic world of the 3rd and 2nd century came to be. Ive only dipped into it a little so far, and specifically the post 79 chapters, but Abbas Amanat’s new book ‘Iran: A modern history’ looks quite good, and might be of interest to some. “Alexander to Actium: The Historical Evolution of the Hellenistic Age,” by Peter Green- and indeed any historical book by Green, but especially that one. “The Forgotten Revolution: How Science Was Born in 300 BC and Why it Had to Be Reborn,” by Lucio Russo and translated by Silvio Levy. “The Ancient Economy (Sather Classical Lectures),” by Moses Finley. “A War Like No Other: How the Athenians and Spartans Fought the Peloponnesian War,” by Victor Davis Hanson. Everywhere you look, history is a story of warring states in a relentless competition for power. Mesopotamia, Egypt, China, pre-conquest Mexico and Peru (and post-conquest too of course). India at least since the Aryan invasion (and probably before). Also Europe right up to the end of World War II. Only nuclear weapons may bring this story to an end (hopefully, knock on wood). I’ve struggled to find a good book on the Seleucids. Does anyone have any recommendations?